Based on SpiralVeyor technology, it has the ability to flex sideways and go through upward and downward bends. This allows for straight, inclined and curved tracks to be incorporated into a single drive conveyor system of up to 50 meters in length. Having this type of flexibility can improve design and optimise potential, especially when dealing with limited floor space or various obstructions like support beams. AmbaVeyor also helps in cutting the number of drives by two thirds. This enhances the versatility of the system as a whole and reduces cost by eliminating not only drives but also wiring and electronic components. The belt moves on slide profiles around the centre and the outer ends of each slat which ensures stable support over the entire belt width. Meaning it can handle almost all of the indoor unit handling applications. 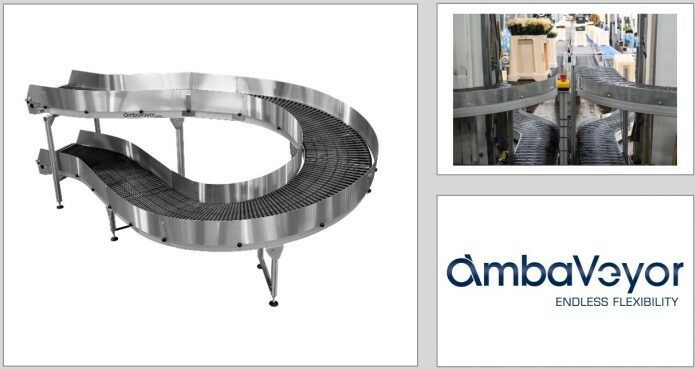 The AmbaVeyor system will help you connect parts of the line without sacrificing valuable space while keeping the system simple and maintenance friendly, concludes the firm.